Engineers are a unique group of people. They are enthralled by science and invention, by mathematics and logic. Their attention to detail is unparalleled, so it would make sense that you would think that whatever gift you give them would be under scrutiny and examination. Are you struggling to find some cool gifts for engineers in your life? Look no further than this list! Nikola Tesla is a role model for many engineers and mathematicians alike–and for good reason. While your engineer buddy is busy scribbling away at their notes and blueprints, they can stay inspired by writing with the Nikola Tesla Engraved Quote Pen. This high-quality pen features Nikola Tesla’s signature along with one of his most famous scientific quotes. Get it here. Every engineer is well versed in the language of numbers. With the Decodyne Math Clock, you can give them a gift that is both practical and entertaining. Instead of typical numbers and numerals, this clock features simple math equations for the recipient to solve to tell the time. Perfect for the office, engineers will get a chuckle out of having to do math equations to determine the time. Get it here. Even hard-working engineers need to take a little time to have some fun once in a while, but good luck pulling them away from their work. With the Rubber Band Engineer, engineers can have fun engineering a rubber band gun, appealing to both their field of work and their sense of fun. Get it here. For those engineers who can’t seem to keep their eyes off of their screens and out of their notebooks, you can gift the Engineering Cheat Sheet T-Shirt to help them get their work done faster. This soft, cotton t-shirt features a number of mathematical equations, formulas, and graphs that they can glance down at for answers when they get stuck on a problem. Get it here. Everyone loves to sit back and have a beer once in a while, and with the Engineer is Always Right coolie, the engineer in your life can do so with sass and personality. This coolie can keep their drinks nice and cold and make a statement about their work all at once. Get it here. What goes into making an engineer who they are? 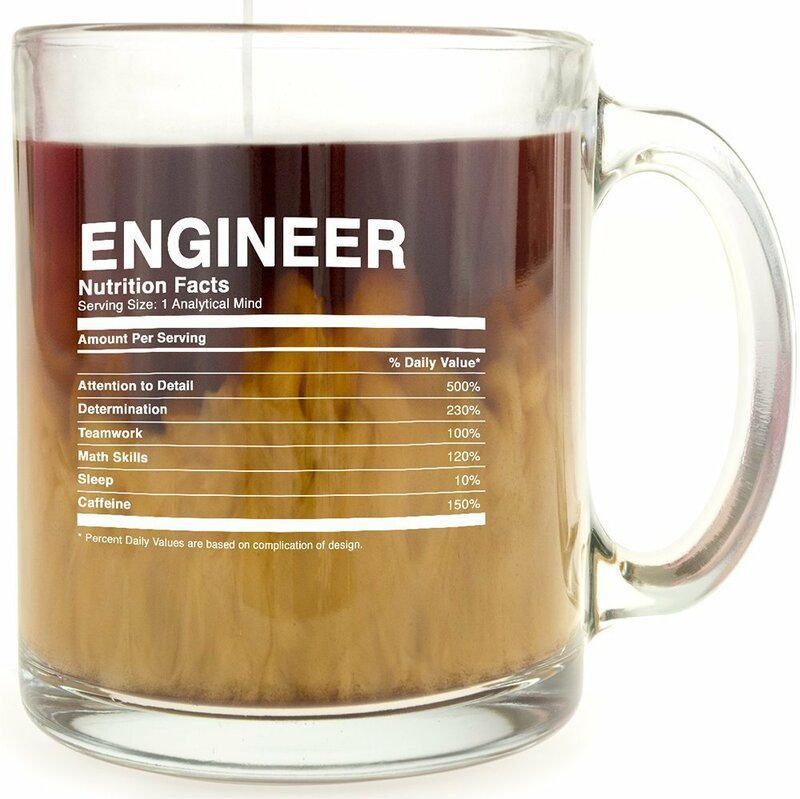 If you want to know, just check out the funny engineer “nutrition” label on the Engineer Nutrition Facts Glass Coffee Mug that suggests a little bit of sleep and a whole lot of caffeine will do the trick! These cool gifts for engineers are sure to earn a laugh. Get it here. The engineer you know always seems to conquer the impossible, and you can show him what a badass engineer you think he is with a handy pocketknife that says as much by gifting the Badass Engineer Engraved Folding Survival Knife. Get it here. Finding cool gifts for engineers doesn’t have to be hard. You can appeal to their love of math and science and give them fun, practical gifts along the way by using the unique gift ideas that are found above. The engineer in your life will appreciate the level of thought you put into their gift for years to come.